That looks like it might be a Mort Kunstler painting. Do you know what the painting is called or who the artist is? I'm definitely excited to read this month's entries! I'm not sure who painted it ... sorry! I'm looking forward to reading the entries, too! =) Thanks for commenting! It is Mort Kunstler painting. 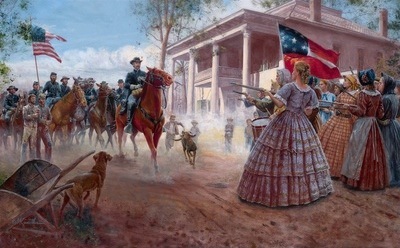 I did not know that it was until my grandfather read the story I posted on my blog and said that the painting was painted by a friend of his, Mort Kunstler. So, yes, it's a Mort Kunstler painting. Awesome!! Thanks for linking up, Clara! And I've linked up now! Elisabeth, thanks for finding the real story. After reading the Kunstler link, my dad and I read an article on Col. LaGrange. It turns out he was a good guy. He was wounded and spent some time in a Confederate hospital. Whether that influenced him or not, I cannot say, but he was known for looking out for civilians and prisoners as he campaigned through the South. Too bad I already wrote my story because this gives me even more ideas! I'm sorry, Emily, I couldn't resist! =) That's my historical-authenticity-reenactor side coming out! But, I DO really love this link up; it's neat getting to read all the different stories inspired by one picture!